The client portal is a page just for you! Here you can access the important financials for your business, contracts, and important emails. Everything is kept in an organized and secure place so you never have to sort through a bunch of emails. We will still use Dropbox and/or LastPass to upload your PDF statements/receipts. I look forward to working with you and thank you for your business! You will need to login with your email address and password I sent to you via email. Please email hello@magnoliavirtual.com if you ever forget or need to reset your password. 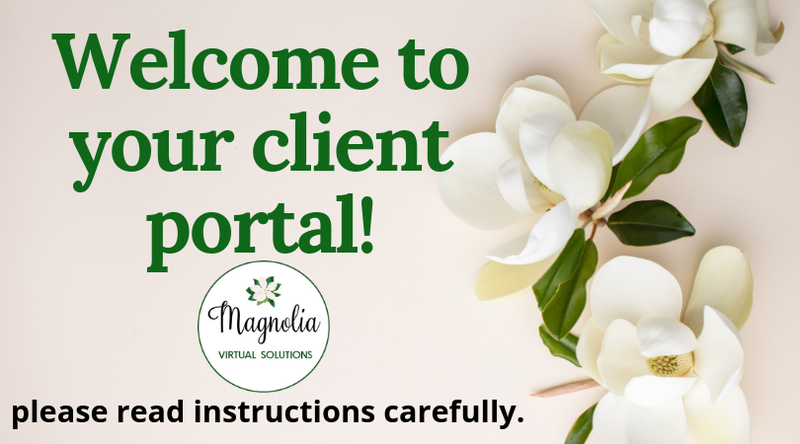 In the future, you can access the client portal via a tab on the Magnolia Virtual Solutions website! After uploading your bank statements and requested documents to dropbox, I will upload your financials statements to the Client Portal.You will receive an email notification when I have uploaded any financials. You will also be able to view our contract. The Emails page will show you important I have sent regarding your bookkeeping project or ongoing services. Your replies will also appear here. While you cannot respond to emails within the portal, having the conversations here in one place will show you our communication history. -Invoicing- You will receive an email when payment is due with a link to pay your invoice electronically through Quickbooks and download a PDF for your records. The Profile section of the Client Portal is where all of your contact information is stored. If any information needs to be updated, click on the gear icon at the top right corner of the page. You can also edit your business information and add an additional contact through this menu. Thank you for taking the time to go over the Client Portal!